With an exiting new life in Paris, Clemmie Hamilton isn’t looking forward to heading home to the picturesque but sleepy village of St Aidan, Cornwall. However, when she discovers that the cosy apartment by the sea, which her grandmother left to her, is under threat from neighbour and property developer, Charlie Hobson, Clemmie realises she can’t abandon her home in its time of need. 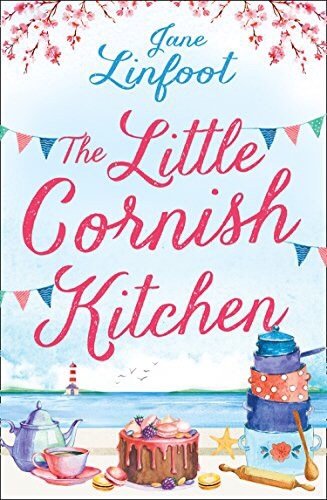 With her childhood friends encouraging her, Clemmie decides to turn the apartment into ‘The Little Cornish Kitchen’ – a boutique pop up pudding club raising money for the repairs to the building in an effort to stop Charlie once and for all. But when Charlie and his easy charm won’t seem to go away, everything soon becomes even messier than the state of Clemmie’s Cornish kitchen. This is I think the fifth book I’ve read by Jane, although I may be falling foul of losing count 😂. I loved her last book so much, the wrap up to the Little Wedding Series, which I can heartily recommend. There’s always a risk, of course, when a writer says goodbye to such well-loved characters. Will the next book be as good? Will the next group of characters hit the right reader spot? OMG I loved this. Jane has a talent to get right down to the funny bone almost right from the start of any of her novels and I was helpless with laughter over the mermaid sketch. Clemmy is a delight and the fact she lived in Paris an added twist. In fact, there’s a sliver of Rachel Khoo and The Little Paris Kitchen here, one of my favourite TV cookery programmes from a few years ago. This added with romance is pure genius. Charlie is the ideal male lead; surly but with the dark brooding look that a romantic hero demands. But more importantly I want a cat called Pancake. There’s lots here for everyone and I think Jane has dug deeper with this work. There’s a new depth here. Lots of twists and turns that kept me guessing in a will he, won’t he sort of way.